Picture yourself in your backyard, on that empty slab of concrete, baking in the sun because you got one of those typical patio designs from a typical home builder. You don’t need to settle for this sunburn of a situation. Consider a reasonably priced aluminum patio cover to turn your backyard into your own retreat destination. The backyard is always an afterthought or ignored completely in the newer neighborhoods primarily because the front of the home is what people see, the inside of the home is what people see next and the backyard is left until the end. It’s unfortunate because most people spend much more time in the backyard than the front. Our expert design and installation team can assess your property and work within your budget to create backyard patio designs that are right for you. The aluminum patio cover is not the corrugated metal that you might be picturing in your head. Brand names like Alumawood and Duralum provide the option of using metal that looks like wood but performs even better. A Teflon surface is something you would expect on your kitchen pans, not your patio cover but this Teflon surface protection comes standard on the Alumawood product. Since the product is made of metal you don’t have to worry about rotting wood and aluminum is the type of metal that doesn’t rust. You end up with a durable surface that resists chalking, fading, cracks, peels, warms, and termites! Now, picture yourself in your backyard but this time you are relaxing under your new aluminum patio cover with a drink in hand. You are protected from the sun but enjoying your time outside with the family. Your aluminum patio cover is now several years old but it is looking just as beautiful as the day we installed it. Don’t bother with curiosity, just call us for a free consultation and in just days you will be enjoying your backyard space like never before! 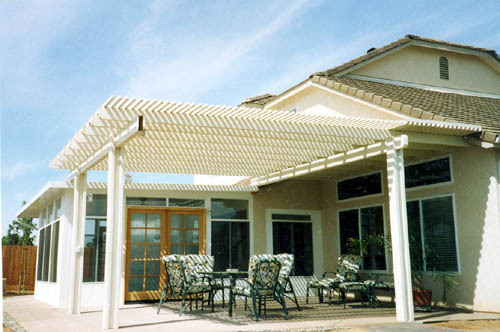 Mico Construction Inc. will provide you with any information about building an aluminum patio cover. We can provide you with a list of different aluminum patio designs using aluminum cover and we will consult you to choose the best aluminum patio style and build it with an affordable price.